The elbow is one of the three main joints in the forelimb and is located between the carpus and the shoulder. An elbow orthosis will cross the elbow joint and extend above and below. In some cases an elbow orthosis can be combined with a carpal orthosis to support across both joints. This type of orthotic device may be used in place of surgery, when surgical repair is not a possible or desired option, or it may be used at some distance after surgery if the procedure did not create the desired level of stability. can have a very complex presentation and it can be difficult to say whether the use of an orthosis will be beneficial. As with all bracing, consultation with your veterinarian is essential to evaluate the joint condition and to determine the best course of management. 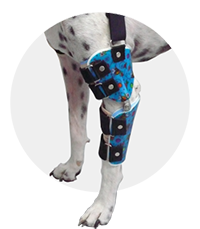 To assist in the resolution of this condition, an elbow protector can be used to off-load the affected area while transferring the pressure to a larger surface on the underside of the forelimb.